Like no other nice light almost orange color. Pleasant citrus scent. Unique flavors hints of citrus very smooth. This is one of my favorites. They serve this on Royal Caribbean cruise. It was nice peachy taste and stands up from rest. This fruity rum is quite drinkable. Probably with sugar, probably full of marketing but the presentation is top notch, the taste bears caramel, vanilla, fruit, citrus... I like it. To much orange taste! It's too unilateral. The old version Planters Gold XO (picture) was much better his taste more complex. Perhaps they've lost their Masterblender while the Anguilla Rum Company was bought by the Patrón Spirits Company. strong aromas and flavours of orange and very smooth. A great alternative rum when you don't want the heavier flavours of the darker rums. Good to start with when discovering the world of rums, it´s smooth and fruity, or rather orangey, and in the middle range to me. Too sweet , to much orange ! But i recon the Ladies Would like it ! A decent rum but with far too heavy orange notes to my tastes. This is not a rum for me. The lack of other things in the taste, makes it a never to own rum. I have to say this rum receives nowhere near the credit it demands. This rum comes at you with multiple flavors first vanilla, then a nice long citrus ride in the middle, and then a lightly wooded cinnamon finish. I enjoyed this rum neat one shot at a time, but let it breath after opening. Overall excellent, I drank a whole one last night and awoke early the next morning feeling 100% no hangover! This is what I would expect from the makers of patron! I find this rum to be lighter tasting than most rums. Smooth and interesting enough to warrant buying again, but a bit too expensive for regular purchase. I recommend this one for non-rum people buying a rum for mixed drinks that aren't cola based, as the "rum" flavor isn't overly pronounced. Great bottle and packaging, nice to see companies put the effort into packaging without going over the top (ahem, vodka manufacturers). 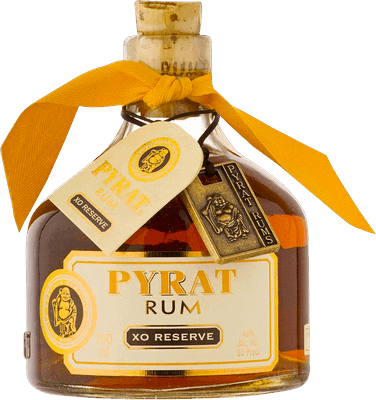 Pyrat is a good not great rum. It has an interesting flavor. I've experienced it best with cola. It is not a good value. This is a good rum. I like the hints of orange and the smoothness. Its a very good choice for mixers, and I love the bottle. To me the orange taste in this rum makes it like a different liquor all together. I like it but be prepared for a very different rum. This is a good rum for people who don't drink rums, it is tasty with no off flavors for the rookies, but it is too sweet and orange-y for the more discriminating palate. Hyggelig rom med kraftige orange toner! Pyrat is a quite drinkable rum but probably best mixed. Can be sipped if cut with water and a lime twist. I don't find the Orange flavor that many speak of. At 19.99 a jug it deserves a 7 and will be in my stock for mixing and the desperation sipper ! Very smooth but with a twist for a finish.